8 Ways To Prepare Tuna: Never Be Bored Again! Tuna ... again ... ugh! With these 8 mouth-watering recipes at your disposal, never again will you utter those words. Ask any bodybuilder or fitness-lover what he or she thinks of canned tuna and there's a good chance that you'll get this answer: "Canned tuna is a time-saving miracle food," said with eyes full of wonder and happiness. Of course, you have to like tuna to eat canned tuna. As far as meal-in-a-can foods go, tuna is bland. If you eat it often-and you should-it will begin to defy all previous experience of the words "boring diet food." But with this nutrition profile: 200 calories, 5 grams of healthy fats, and 40 grams of lean protein, how can you say no to canned tuna? With these 8 mouth-watering recipes you'll never have to neglect tuna in favor of something tastier. Your canned tuna will wear a new disguise every time you crack open a can. The secret identity of this delicious, protein-packed fish will remain hidden while your muscles bask in the benefits of healthy nutrition. These recipes take just minutes to prepare and will make sure you're never missing the mark on your protein requirements. Feta cheese is a great source of protein and high in calcium, which helps with proper muscle contraction. Make sure you choose the lowest fat variety of feta cheese that you can find. If you're a fan of feta salad, transform that dish into a tuna meal that's packed with protein, healthy fats, and slow burning carbs. Prepare the pasta according to the package directions and then top with feta cheese and canned tuna. Continue stirring until the feta cheese melts slightly and then top with cherry tomatoes, olives, and drizzle with some olive oil for healthy fats. Sprinkle on any desired spices or healthy condiments like lemon or balsamic vinegar. Serve immediately. 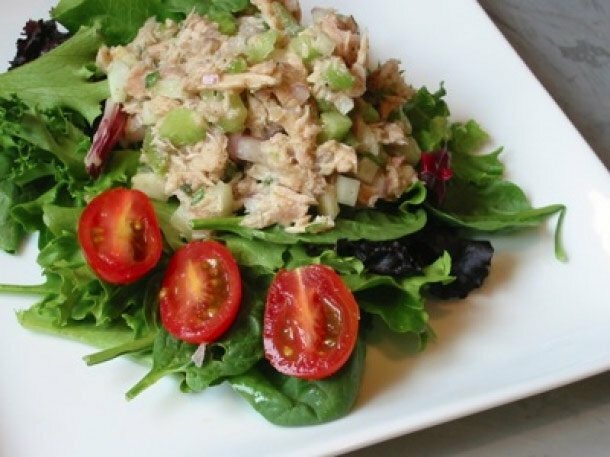 If you're on a low carb diet, then this tuna salad dish will fit your diet perfectly. It's fast, simple, and contains plenty of Lycopene, a healthful plant compound found in tomatoes. This is a great recipe if you're in the mood for a creamy dish that comes with a bite. Unlike other creamy dishes that are usually high in fat, creamy Dijon tuna is low in both fat and calories but high in protein thanks to the tuna. Combine the Dijon mustard with Greek yogurt until well blended. Sprinkle with salt and pepper and any other spices you desire. For those days when you need a warm meal on the go, this tuna melt works perfectly. 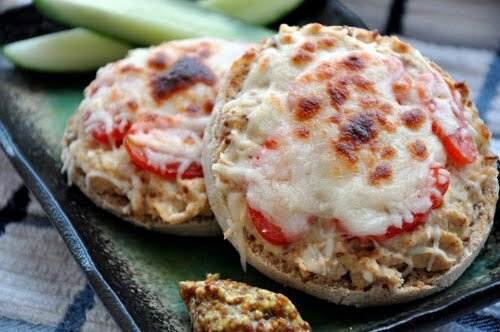 Unlike most tuna melts that are high in saturated fat and carbs, this one is moderate in carbs and packs the protein-punch of a can of tuna to support your lean muscle building goals. Due to the small size, this one cooks perfectly in a toaster oven. For something totally different, try this apple tuna salad. With apples and cranberries you get extra dietary fiber and a surprising sweetness to balance out the tartness of red onion and balsamic vinegar. Feel free to substitute the dressing to any other kind that you like. Toss all ingredients in a large bowl except the olive oil and balsamic vinegar. Combine these last two ingredients and then drizzle over top. If you're a pizza fanatic but don't like what it does to your waistline, this is a much healthier alternative. Not only is this pizza lower in carbohydrates, but it's packed with nutrition from fresh veggies to protein and slow-digesting carbs. Smear the pizza sauce over the soft tortilla and then spread the tuna evenly over top. Next, add the sliced vegetables over the pizza, throw on the spices you like, and then sprinkle the cheese on top. Place in the oven at 350 degrees Fahrenheit and bake for about 6-8 minutes, or until the cheese has melted and the tortilla looks crispy. Another quick and easy recipe, this one can be made in minutes, and it's easy to prepare a large batch to keep in the fridge and grab for a quick lunch before you head out the door in the morning. Serve it on a whole wheat roll or with any other carb of your choice. Slice the pickles into small pieces and then mix into the can of tuna. Stir in the low-fat or fat-free mayonnaise and then add salt and pepper to taste. A great option for a fast lunch, this Italian tuna pita is easy to store as a quick snack for when you're trying to increase your calorie intake. As with the rest of these recipes, you get a balance of all three macronutrients: proteins, carbs, and fats. That means lasting energy throughout the afternoon from this healthy meal. Combine the tuna with 1 tbsp Italian salad dressing and place in the pita. Add in the shredded lettuce, the cherry tomatoes, and the cucumbers, and then drizzle with the remaining Italian salad dressing. To finish off, don't forget to arm yourself with a sharp can-opener for quick canned-tuna access. Whether you're building a lean-muscle foundation, toning up, or trying to reach peak physical condition, tuna can be your best friend when it comes to nutrition. Don't listen to the tuna-haters, and try a little creativity with this time-saving, lean protein source. Your taste buds won't regret it.